Please join me in welcoming Ann Raina to Living After Midnight. • Tell us about your hero’s typical style of dress. What is the condition of the clothing? Nicolas Hayes is an FBI agent which means he has to follow the bureau’s dress code while on duty. This includes a dark, not necessarily black suit, white dress shirt with a matching, unobtrusive tie, and shined shoes. There’s no deviation from this rule even if he sweats buckets in summer. • What does the choice of clothing tell us about him? Nick’s dedicated to his job and wouldn’t dare show up at work in jeans and t-shirt. It’d be against his nature to appear sloppy even if only he’d think of himself as an addlebrained wood worker with a predilection for red-checkered flannel shirts and baggy pants. • How do his outfits set your hero apart from other characters? Nick always dresses to the nines—not only while working. His lover, Jacklyn, appreciates his dedication to detail when he takes her out. He matches his suit to the colors of her dress, and he’s circumspect to never outshine her—if that’s ever possible. • Is this how he wants to dress? If yes, why? If not, what would he choose to wear and why? While at work, Nick represents the FBI and its high standards in dress code and behavior. During the private and very intimate time with his lover he’s more into wearing little to nothing…if you leave out the handcuffs and other stylish leather and metal accessories that the couple associates with their special love life. Ann Raina lives and works in Germany with cats and a horse. Riding and writing are her favorite hobbies. So far, she has written twenty novels for eXtasy Books with more to come. 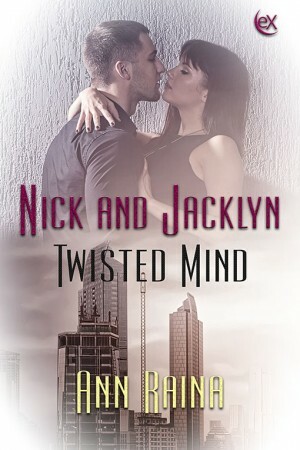 Her latest series, starting with Twisted Mind,revolves around an FBI agent, his very dominant lover, and cases of violent crime. In all her books, she combines romance, suspense, and humorous elements, for no thrilling story can stand without a comic relief. After four murders of young men along the east coast, the FBI realizes they’re dealing with a serial killer. Agent Nicolas Hayes is assigned to lead the investigation. Besides solving the crimes, he tries to spend time with his new flame, Jacky, who’s got ideas of her own about how their love life should develop. Things turn ugly once a fifth kidnap victim is reported. Time is running out to find him alive. “Yep.” Jason took a swig of his Diet Pepsi without losing eye contact. Jason’s eyes widened, but he kept his mouth shut. The waitress came to ask if the food was all right, and they both agreed. She left with a professional smile. Jason rolled his eyes and blew out air. “That’s too philosophical for lunch.” He continued eating his hamburger. Thanks, Ann. It's been a pleasure to have you on LAM. Come back any time!